Created in his name, Serving Aces for Sarcoma continues his legacy. Scott’s disease did not compare to any other battle he had ever experienced. Within five short months he learned of his condition and passed away. Read about Scott and how his loving family hopes to help others. Born, raised, and having lived most of his adult life in the Birmingham-Bloomfield area, Scott enjoyed numerous acquaintances from many different areas of the community. He graduated from Cranbrook High School in 1978. Throughout his high school career, Scott participated in three varsity sports every year; Tennis, Skiing, and Soccer. However, the highlight of his high school athletic years came during his senior year when he won the Michigan High School State Tennis Championships at number one singles. This was a crowning achievement for him, which led to a full scholarship at Michigan State University, where he played on the Varsity Tennis Team all four years. Having been the captain of both his high school and college tennis teams, Scott learned he could use the game of tennis to positively influence others around him. He started his tennis career by playing in the Junior Interclubs at a very young age. Scott played in the Interclubs every summer through age eighteen for the Bloomfield Open Hunt Club. He had fond memories of those days and remained lifelong friends with many of his teammates. Scott was a tough competitor. Believing that tennis had taught him strength and discipline, he enjoyed encouraging young children to become involved with the game. Scott recognized a need for junior tennis programs. He developed and continued to teach a youth tennis program each summer while enrolled at Michigan State University. He was always anxious to pass the life lessons of tennis on to, what he referred to as, “The Next Generation”©. After his college years, with a Bachelor’s Degree in Finance from Michigan State University, Scott held various sales and marketing positions with a number of companies, including several in the automotive components industry. In 1996, Scott joined Eaton Corporation. Starting out as a Marketing Manager for one of Eaton’s automotive divisions, Scott followed the company’s direction and obtained an Executive Master’s Degree in Business Administration from the University of Michigan. 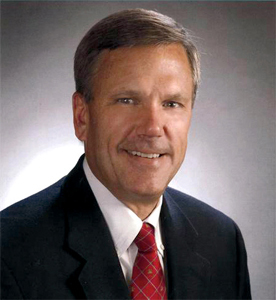 Ultimately, Scott was named the Chief Executive Officer of Eaton’s Automotive Group prior to his passing in June of 2008. Scott was the husband of Julie (Link) for twenty two years and the father of Courtney Link, Kerry Leone, and Ryan Scott. Faith and family were always his guiding light and because of this, the Scott L. King Serving Aces for Sarcoma Event was created in his name. Scott’s disease did not compare to any other battle he had ever experienced. Within five short months he learned of his condition and passed away. With a feeling of helplessness, the King family started this event with the intentions of raising awareness and hope for a cure for similar victims of the same disease and accomplishing this hope through the ideals, experiences, and beliefs of their loving husband and father. Our Mission Statement: Raising funds for Sarcoma Research, while promoting Junior Tennis in all communities.